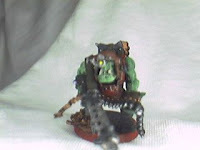 I finally finished my Big Shoota. He was a complete blast to paint. The extra details like the pile of empty shells at his feet, and the discharging shells from the gun made it fun to paint and put together. I didn't get any good pictures of it, but one of my favorite things about him was the backpack. 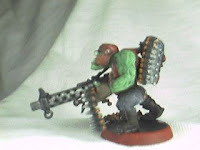 Something about a bag that's sewn together with bullets sticking out just seemed appropriately Orky. 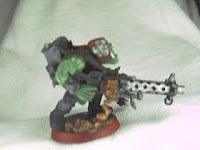 The holes on the gun are decidedly dark, because I painted the barrel silver, and then highlighted black around the holes to look like smoky debris had built up due to excessive heat from the dakka. So now I'm on to Boss Zagstruk.